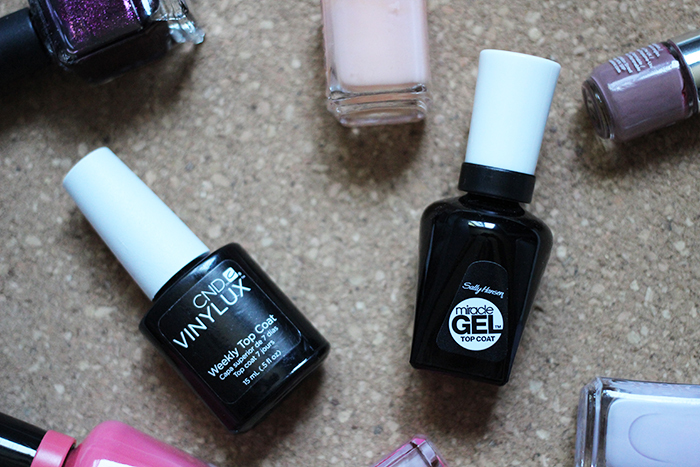 The Not-Gel Gel Top Coats – amandarobots. I must confess, I’ve never had a professional gel manicure. I don’t get manicures all that often, because I feel like I can do an equally effective job at home thanks to the magic of YouTube. As such, I’m especially fond of at-home gel options (like the Sally Hansen one); however, gel that you cure with a UV light can be incredibly difficult to remove, and I’m just not about that life. They’re at-home nail polish systems that promise all the shine and staying power of Shellac and company without the UV curing and impossible-to-remove-unless-you-scrape-off-half-your-nails situation. I’ve tried two of these systems: CND Vinylux, made by the same company that makes Shellac, and Sally Hansen Miracle Gel, which appears to be modelled after the Complete Salon Manicure polishes, which I (mostly) love. Promising, right? Well, the only part of these systems that I stuck with are the top coats. It’s just not (financially and mentally) reasonable to try to dupe well-loved polishes in quasi-gel form, especially with a polish collection as vast as my own. I figure that one way to get all the shine and at least some of the staying power is to use the top coats, right? I purchased the CND Vinylux Top Coat (with an unremarkable polish shade from the collection) back in December. I fell in love with this top coat. I had previously been using Seche Vite, and although the CND doesn’t dry nearly as quickly, it doesn’t get the weird shrinking-once-dry effect that Seche Vite gives (all my Seche Vite users, you know what I’m talking about!). The Vinylux Top Coat has a lovely wide brush that’s not too densely packed, which means it fans out over the nail to glide over my polish job really nicely. And the shine – the shine is incredible, and certainly better than other top coats I’ve used. There’s no 7-day wear without using a Vinylux polish underneath, but over my regular polishes (Essie and Barry M are my usuals), this top coat extends mani life by a day or two. I get minimal tip wear, and no big chips. The Sally Hansen Miracle Gel Top Coat performs less well. Although the brush is nice and wide, for some reason, the bristles are incredibly stiff and densely-packed. They don’t fan out and glide across the nail at all; instead, they scrape through my polish. I consistently end up with colour on the top coat’s brush, regardless of how long I wait for the polish to dry. Perhaps I could tolerate that in exchange for mind-blowing wear or shine, but I don’t get either.With a SH Miracle Gel Polish, the whole shebang lasts a full 7 days. Over a regular polish, the polish itself seems to get brittle and I can see teeny tiny cracks near the tip two days in. Also, it’s probably one of the least-shiny top coats I’ve ever tried. Given that they’re each around $11, if you’re looking for a gel-effect top coat, Vinylux is the way to go.